Lots of people are looking into “alternative therapies” for themselves and their pets, for the treatment of conditions that have not responded well to traditional Western (also called allopathic) medicine or surgery. Alternative therapies is a term often used to include herbal and homeopathic medicines, nutritional therapy, therapeutic massage, acupuncture, and even spiritual healing and laying on of hands. Many of these healing modalities have come to us from other cultures and are actually quite ancient. Acupuncture developed in China between 2,000 and 4,000 years ago and was the subject of some of China’s earliest written works. Acupuncture is based upon the theories of yin-yang and the five elements, two interpretations of natural phenomena that originated in ancient China. Yin-yang represent the two opposite aspects of everything in the natural world, as in hot-cold, big-small, up-down. Disease is perceived as an imbalance of the Yin and Yang, or an imbalance in the healthy equilibrium between two extremes. This imbalance can be corrected by correcting the flow of energy through meridians or pathways in the body. By stimulating points along the meridians, acupuncture acts on these energy pathways to rebalance and restore equilibrium. Five-element theory relates imbalances in the body to the five natural elements; fire, water, metal, wood and earth. From a Western perspective, acupuncture has been shown to increase circulation and cause the release of neurotransmitters and neurohormones, including endorphins, the body’s natural pain-killers. Acupuncture’s potential effects include relieving muscle spasms, stimulating nerves and stimulating the immune system. During an acupuncture treatment the practitioner can utilize sterilized thin metal needles, alone or with moxibustion (heat provided by burning a Chinese herb) or electroacupuncture. Some conditions respond to aquapuncture (injection of a mildly irritating substance at the acupuncture point) or implantation of a sterile gold bead at specific acupuncture points. Recently cold laser treatment of acupuncture points has also been successful. The method of point stimulation varies with the disease process and the practitioner. When needles are used, there is often a brief moment of sensitivity as the needles penetrate the skin. Once the needles are in place, most patients relax, sometimes falling asleep. In small animal veterinary medicine acupuncture is most frequently used for musculoskeletal conditions including arthritis, hip dysplasia, intervertebral disc disease and chronic injuries. However, other conditions which have also responded well to acupuncture treatment include lick granulomas, epilepsy and feline asthma. Owners often chose to treat their pets with acupuncture because of poor response to Western medicines, chronic disease that is difficult to manage, or potential toxicities or side effects of Western medicines available. Acupuncture itself has little risk of side effect if practiced by a competent acupuncturist, as it works with the body’s own system of healing. Treatments usually last for ten seconds to thirty minutes, depending upon the condition treated and the method employed. Patients are initially treated one to three times a week for four to six weeks. A positive response is often noted within the first four to six treatments, sometimes earlier, depending upon the condition treated. There is frequently a delay between the onset of treatment and a visible, lasting response to acupuncture as the body ‘re-circuits’ itself. 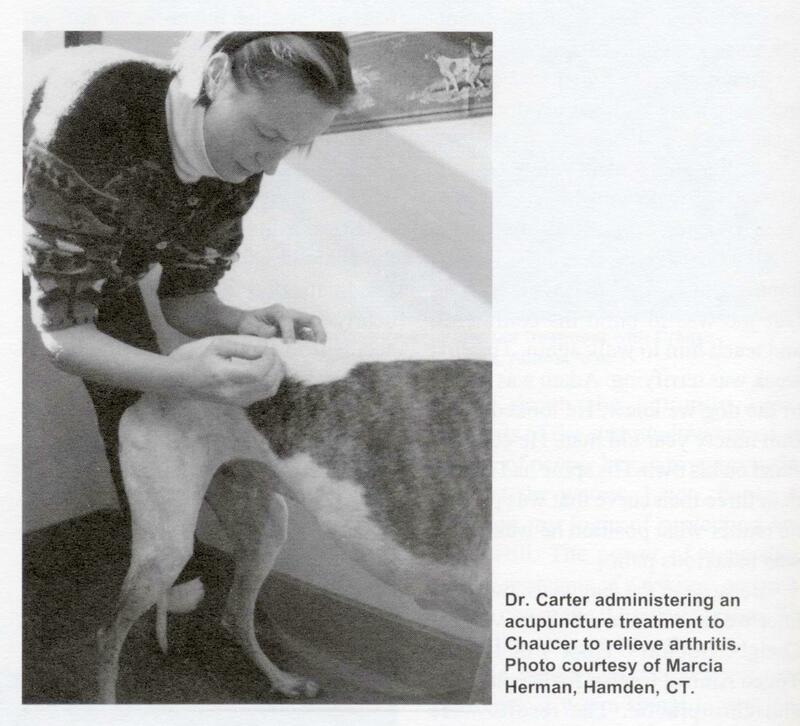 Certification as a veterinary acupuncturist requires a veterinary degree and successful completion of training according to the guidelines of the International Veterinary Acupuncture Society, as well as acceptance of two case reports for publication.